You wish to sell your coin collection or give up a portion of your collected coins? You’ve inherited and want to sell the collector coins? There are duplicates in your coin collection? You’re thinking of redesigning your collection? Whatever the case may be, we look forward to advising you in the sale of your collector coins and medals. Contact our service team and make an appointment with the responsible expert. He or she can recommend the best way to turn your minted valuables into cash. 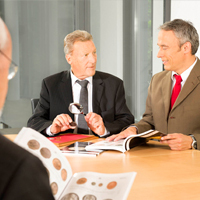 Our team of specialists guarantees you expert processing of your consigned coins, for a successful sale of your coin collection. We will painstakingly establish the price estimate for your collected coins on the basis of our outstanding market expertise. The items will be announced at 80% of the price estimate listed in the catalogue. This system protects you as the consigner of your coin collection. No fees will be charged for coins which are not sold. Our catalogues are of the highest quality standards and are internationally recognized. Our customer file is one of the finest in the world. As the consigner of your collector coins, you too will profit from our individual and personalized customer support. As consigner, you will receive your auction proceeds within 45 days of the auction date. Special arrangements are possible upon consultation. Numerous safe delivery routes lead to us: whether we personally pick up your collection at your home or offices, or the coins are sent by post or with a valuables transport service, you can best decide after a personal consultation with our customer service department. As soon as the coins leave your premises, our insurance covers all risk. Not all coins are most appropriately acquired as individual items. Place your trust in the experience of our experts, who can integrate lower-priced coins into interesting auction lots with professional care. For one of our live auctions, the estimated value of your consigned coin collection should be at least 1,000 €. Our eLive auctions are a sensible alternative for coins with a lower estimated value. These internet auctions of collector coins, which take place monthly, also serve customers from all over the world. You will immediately receive a receipt document upon consignment of your coin collection, which records its delivery. Within five weeks before the auction date -- at the latest -- you will receive an exact listing of your items with the corresponding catalogue numbers. Within one week following the auction date, you will receive the list of results and thus information on all proceeds obtained. Profit from the appeal and reputation of a leading company in the field of coin auctions and the gold trade, and sell your coin collection successfully! You may request, with no obligation, our contracts for the consignment of your items and collector coins. If you have any questions or encounter any problems, please do not hesitate to give us a call. We would be glad to assist you. With this newsletter you will receive regular, current information on dates and background, on the Künker Company and the world of numismatics, and on the contents, collection areas and items to be featured in coming auctions.